In early March, the state education minister had said the Assam Women’s University would be downgraded to a technical institute because it did not have a permanent VC. Students of Assam Women’s University (AWU) in Jorhat have been protesting — for more than a fortnight now — against the BJP state government’s decision to downgrade the university to a ‘technical institute’. And student organisations from across the state are supporting the struggle. 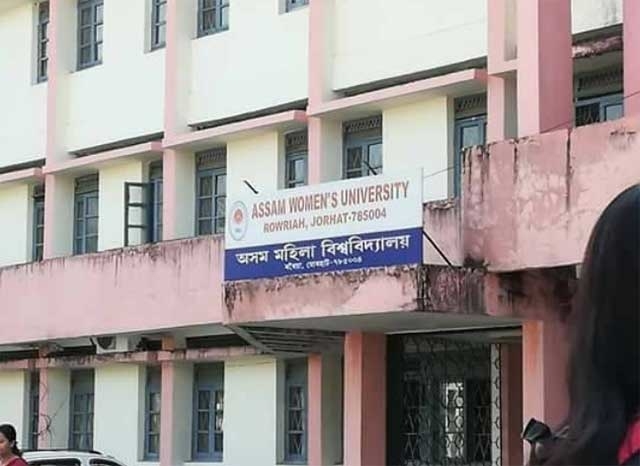 AWU is the only women’s university in Assam as well as in the entire North East region, and was set up after the passing of the Assam Women’s University Act in 2013. As of now, it offers 13 postgraduate and two undergraduate degree courses. However, AWU has been functioning without a permanent Vice Chancellor (VC) since classes began in 2014. Instead, the VC of the Assam Agricultural University (AAU), KM Bujarbaruah, was made in charge as the ‘mentor’ of AWU. Two batches have already passed out. Now, the BJP government is using this fact — that the varsity lacks a permanent VC — to justify its decision to downgrade the status of AWU from a university to a technical institute. Never mind that so far the state government had been giving assurances students — who had been demanding a permanent VC and had held protests earlier as well — that a VC would be appointed soon. But in early March, state education minister Himanta Biswa Sarma said on a local television channel that the degree certificates of AWU had no validity as the varsity lacked a permanent VC. He said that was the reason that the university would be converted into a technical institute instead. Before the minister’s statement, there had only been a report in the local newspaper simply stating the government’s decision regarding the status of the university. Last year, following student protests demanding a VC and permanent positions for the faculty (all faculty members are currently employed on ad hoc basis) as well as better infrastructure, the state government had set up a four-member Expert Committee to review the functioning of AWU. The Expert Committee consisted of Assam state secretary for higher education Krishna Gohain, the VC of AAU (currently in charge of AWU), the VC of Tezpur University (a central university), and the registrar of AAU (also serving as registrar of AWU). In June 2017, the committee submitted its report to the government — and gave a glowing review. In fact, the report recommended that AWU should be made an ‘affiliating university’, that other women’s colleges should be made affiliated to the varsity. But instead of heeding that report, the BJP government in Assam, led by Chief Minister Sarbananda Sonowal, seems to have made up its mind to divest AWU of the very status of a ‘university’. Students began protesting against this decision on 8 March. Hundreds of students went on a hunger strike for 36 hour on 19 March. They have been organising protest actions, such as rallies, every day. “We even met the Chief Minister on 20 March, but he just asked us to give up all hope of AWU remaining a university. But we are not going to give up,” said Sultana Khan, 2nd year MA student in political science at AWU, speaking to Newsclick. In the past week, several students’ organisations — including the Students’ Federation of India (SFI), the All Assam Students’ Union (AASU), and the All India Democratic Students' Organisation (AIDSO) — have joined the AWU students in their agitation. In fact, students from many colleges under Dibrugarh University in different districts have also staged protests, demanding that AWU retain its university status. “This proves the anti-student nature of the current BJP government,” said Sangita Das, joint secretary of the SFI Assam State Committee, speaking to Newsclick. “Along with the students of the women’s university, SFI and different student organisations are protesting against this authoritarian and undemocratic move of the BJP government. It goes against even the BJP government’s own slogan of ‘Beti Bachao Beti Padhao’. But the government is still not paying heed,” she said.